Krampus (2015) is an American fantasy-horror-comedy movie that is based on the characters from Alpine folklore. Director Michael Dougherty (Superman Returns (2006), X-Men 2 (2003), Trick ‘r Treat (2007)) did an incredible job executing Krampus. One new thing that I greatly appreciated that Michael took a risk within this Christmas horror movie is bringing the children’s toys to life with demonic forces. Michael delivers a great kid-friendly dark story that is suitable for all age groups and everyone, whether you love the holidays or not. Michael shines in the visual aspect of this movie as he has a background in visual arts. I love all of the details and cannot get enough of the sets as they were tremendously visually appealing in every way. Michael blended the horror and humor perfectly which results in an entertaining experience that I hope to indulge in soon again. Krampus revolves around Max (Emjay Anthony - Chef (2014), It’s Complicated (2009), Insurgent (2015)) who rips the letter he wrote to Santa after his cousins stole it and read it aloud at dinner. Max’s family invited several family members to spend Christmas with them, but things are not going too well as it is hard for everyone to get along. Max throws the ripped letter out of the window with anger resulting in him summoning Krampus, who is the Christmas demon . A massive snowstorm occurred out of nowhere after Max threw the pieces of his letter out of the window. The town was soon engulfed in darkness as the snowstorm cuts the power to the town. The family woke up the next day not knowing that their lives are about to be changed because no one listens to Max. The family soon learns that there are monsters lurking outside, and they must fend for their lives. 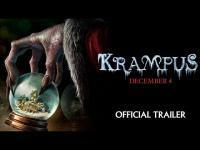 Krampus is one guy I do not want to mess with and after seeing this movie, I know I will never lose hope in the holidays/Christmas. Max finally figures out that he is the reason for Krampus making his grand appearance and wreaking havoc on his family and town. Will Max be able to convince Krampus to stop his madness and make everything right? Will Max survive? I love the evil Gingerbread Men, Snowmen and the breathtaking sceneries that give you a haunting feeling. The creature designs were kind of spooky but fit well with the movie and gave the movie the right amount of creepiness it needs. As much as I love this movie and recommend it for everyone to see, I would not like a bunch of demons looking for human blood to intrude on my holiday. The actors all did a fantastic job with their respective roles, and their costumes made it all the better. The cinematography was spectacular as well as the music, sets, special effects and camera angles. I am looking forward to seeing more movies from director Michael Dougherty. Avg. Rating: 3.66/5 stars from 51,589 users.